Book 1: A Legacy of Light — The traitor Cadigus has captured the throne of Requiem, an ancient kingdom whose people can become dragons. In the wilderness, rebellion brews. The Resistance is small, but its cry is loud: "The tyrant must fall." Book 2: A Birthright of Blood — War rages. Fire rains. Requiem, the land of dragons, is tearing apart. When the hosts of Cadigus fly against them, can the resistors save their homeland? 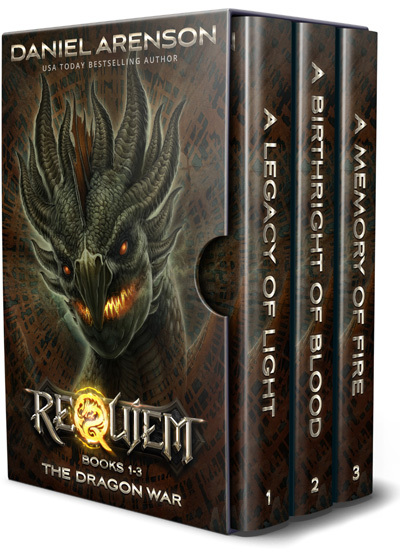 Book 3: A Memory of Fire — Darkness covers Requiem. General Cadigus, usurper of the throne, rules with an iron fist. Bloodied after a long war, the Resistance musters. Rising as dragons, lighting the sky with fire, the resistors fly to their last stand.